Almost a century after Daniel Brenner’s school report card was sent home for his parents’ review, Perigee is proud to announce the publication of UNCLE DAN’S REPORT CARD: Helping Our Children to Build Strength of Character with Healthy Habits and Values for a Lifetime of Success by Barbara C. Unell and Bob Unell (Perigee Trade Paperback Original; August 2, 2011; $14; ISBN: 978-0-399-53677-9). When the authors discovered their uncle’s 1914 report card, they found that children were graded not only on academic subjects but also on behaviors and values. The report card was divided into two main sections: a “School Report” on the left and “The Home Report” on the right. The “School Report” listed the student’s subjects at school while “The Home Report” revealed what they believe to be the secret to their uncle’s success in life: grades for kindness and social responsibility, morning chores, truthfulness, personal habits, thrift and industry, reading for pleasure, manners and many more. Barbara C. Unell is a long-time advocate for good character development in children. As the author of several parenting books, including 20 Teachable Virtues, she has been instrumental in bringing together educators, community leaders, and parents through such ventures as the Character Education Partnership and “Kindness is Contagious…Catch it,” a school-based education project as well as the Uncle Dan’s Report Card pilot program in school districts in Kansas. Bob Unell is a former teacher, marketing executive, and co-founder with Barbara of Twins and Kansas City Parent magazines. Along with Barbara, he is a partner in the Daniel L. Brenner Family Education Center, providing programs in the areas of parenting and character education. 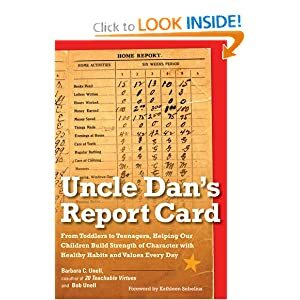 In UNCLE DAN’S REPORT CARD , Barbara and Bob promote the notion that a home should be considered an ongoing classroom. Far from being an historic curiosity, this important book provides parents and teachers with life lessons and action steps that will encourage children to recognize and practice good habits in the course of everyday living. What was amazing about this book was the fact that it was written so long ago but the lessons held within the book are timeless and the ideas that are shared could be ones shared from experts today about how to have your children growing up happy and healthy and well adjusted in our society today. While there are some parts that you can still tell came from the 1920's, all-in-all the book shared so many great tips that I have already tried to share with my own kids. The book was an easy read and each chapter flies by. The values that this book instills shows all parents the things that all children should be learning in their formative years. At the same time though this book also puts parents to task in regards to how they should be engaged in their own child's learning. I know that I will be referring back to this text as they get a bit older.